Last week, on the heels of some exciting vacation plans in the Fab household, I immediately started thinking about summer dresses. 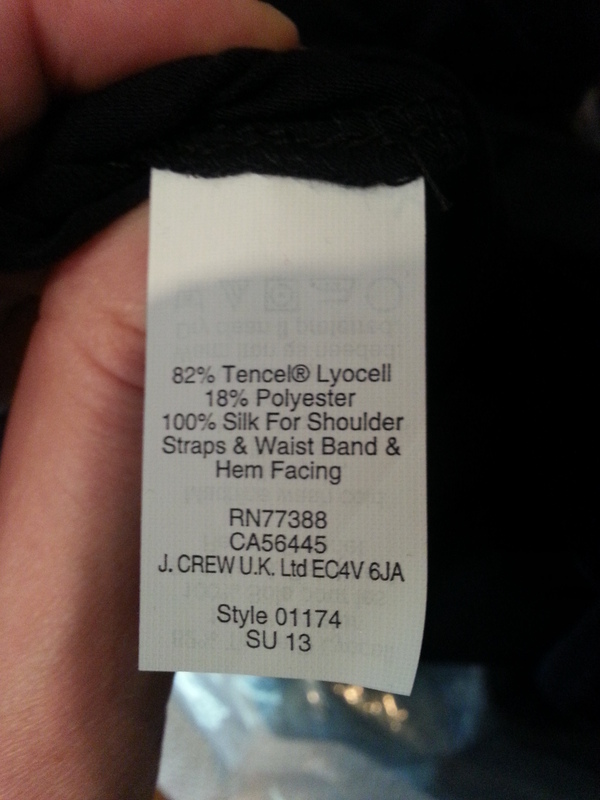 Lucky for me, J.Crew was running off a 20% off dresses sale, and there was a stackable 20% off coupon code available. Surprisingly enough, the initial purpose of my order was a suit vest for DH, but I decided that (of course) I needed something for myself (how often do you get stackable coupon codes? I rest my case). I’m still collecting my thoughts when it comes to travel attire, but the J.Crew Silk-trim maxidress caught my eye while perusing the dresses and I figured I’d give it a try. It looked like a comfortable dress that could be casual or dressed up. And it wasn’t $300+ like a few other “Collection” dresses I was lusting after (Collection Noelle dress I’m looking at you). At any rate, I decided to go with navy since the other colors didn’t seem very summer-y. I suppose that might have to do with the whole “dress it up” factor, but a coral or mint might have been pretty. Just sayin’. Here’s the website stock photos. I also was slightly concerned because the model is way thinner than I am and whoa, it gives her an INSTANT hourglass shape. Yeah, I don’t need help in that department. So, my hopes were low. Sometimes, these things work out for me and other times they’re a total disaster. But the power of the Crewlade is strong, so of course I keep coming back for more. And occasionally it does work out in my favor. Anyway, after a record shipping time of three days…here we go. 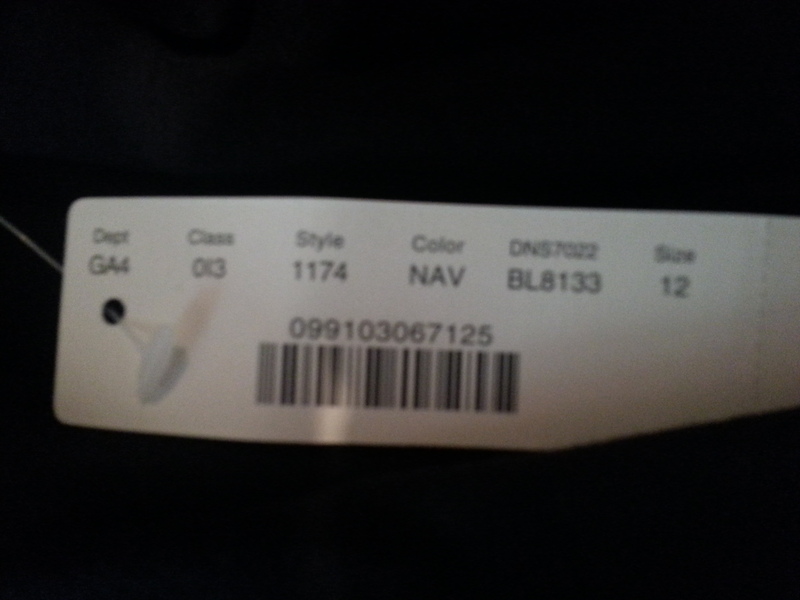 First off…the tag details (FUN). 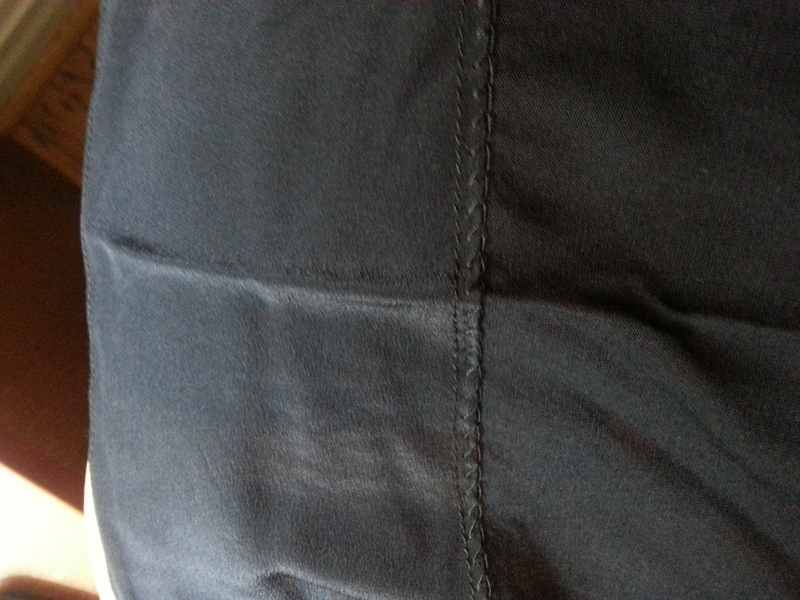 This is the underside hem of the dress. There’s a few inches of the same silk from the straps and waistband sewn in the inside hem. I tried my best to get good photos of the dress, but the dark color made it hard to photograph. I’d say it’s a dark navy and the dress itself is very lightweight. 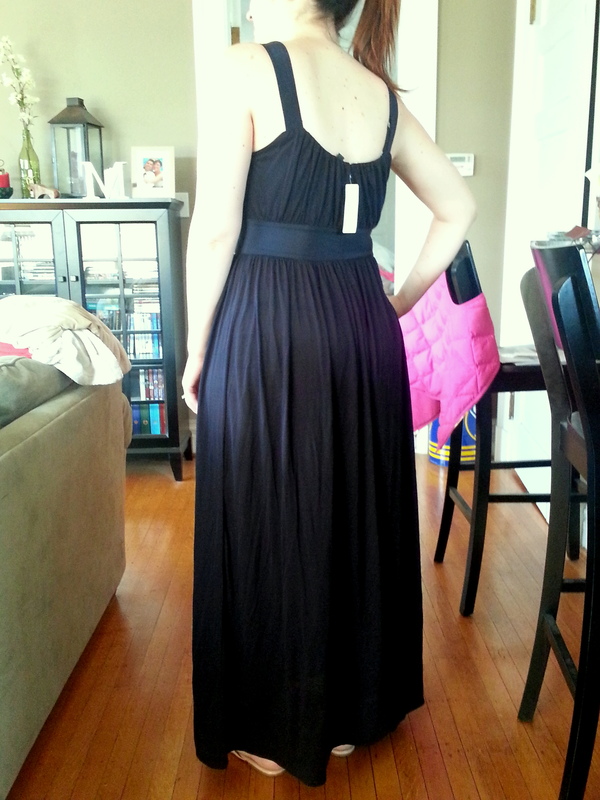 Definitely moreso than the Amie maxi-dress (which I think is cotton, so I guess would make sense that it’s heavier). Even though it’s lightweight, it isn’t see through, but that’s probably another reason for utilizing a darker color palette in this dress. After some failed self-photo attempts in the full size mirror, I enlisted DH to take some photos of me in the dress. Cue the late afternoon sun and our Northwestern facing apartment. I lack the Photoshop skills needed to tone down the washing out of my already extremely pale skin, but you get the idea. The dress zips up the back which helps secure me in to the dress, and another bonus is that I’m just wearing a regular bra with this dress. No need for a strapless bra, hooray! The silk trim around the waist and on the straps is very subdued, not enough to make it formal, but it makes it nicer than your regular jersey maxi dress. Like I said, I don’t need any help in the hourglass category. I took my regular J.Crew dress size (12) in this dress. I found it to be very flattering in the mid-section and as far as cleavage goes, usually I’m falling out of low-cut J.Crew dresses in every which way so it was nice that I only had modest cleavage in this dress. I’m 5’8″ and the dress worked perfectly with flip flops but I also tried it on with low sandal heels and it still looked ok. 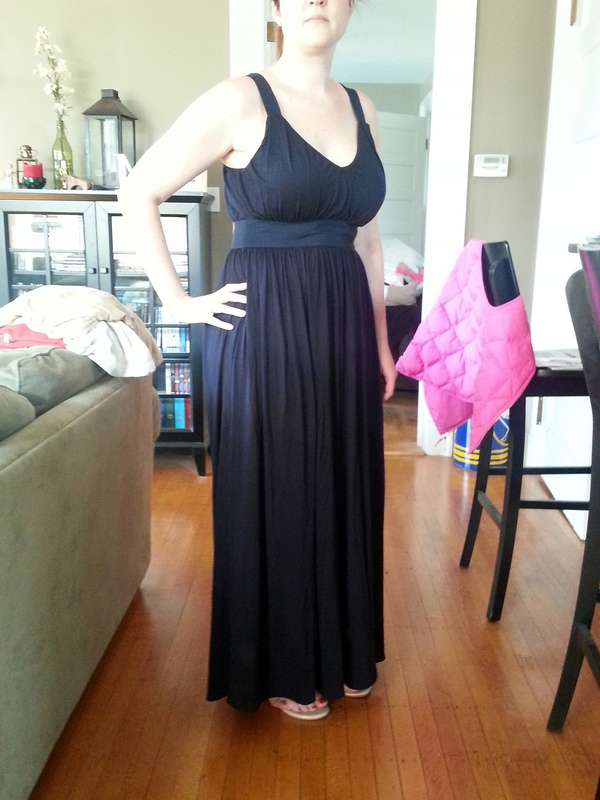 I wouldn’t rock any tall 3+” heels with it or it would look odd, but I’m happy with this as a flat/low heel dress. I took a lot of pics of me in this dress and in some I think it’s a bit too figure enhancing, but really, at the end of the day I embrace my curves and I love how comfortable it is. It’s probably a keeper and will very likely make it in to my suitcase for our summer vacation. So, what do you think? Do you have this dress? Love it or not so much? I would love to hear what you think and thanks for visiting! I probably should say summer brights are more appropriate for this outfit today, as temperatures were in the high 80s today. Of course, I was inside at work all day but that doesn’t mean I wasn’t looking fabulous in my bright colors! Today I wore one of my favorite J.Crew pencil skirts from a few years ago. Look at all of the wonderful colors, isn’t it fab? This shot doesn’t even do this skirt justice, but the outfit possibilities are endless. Pink! Purple! Green! Yellow! Today I hit multiple options by pairing this skirt with my J.Crew Blythe Blouse in Sea Glass, my Cece Suede ballet flats (from last year) in Wild Berry and the J.Crew Factory stone chandelier necklace in bright sun. The necklace was the final “pop” that made this outfit ready to go. Here’s the finished product. 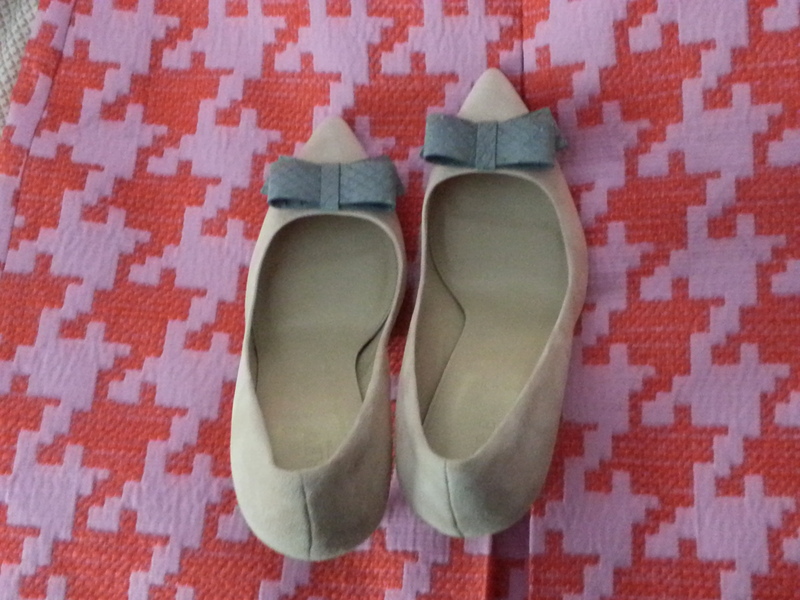 Once again, flats won, but they’re comfortable and cute, so what’s better than that? I sadly even needed my cashmere boyfriend cardigan as a semi-blanket today because it was so cold in my office. But at least I looked bright and sunny so it didn’t matter that the office was so cold. I’m glad to have this skirt out and back in the outfit rotation for summer…makes me wonder why I’ve had pants on for so many months! So that’s it for Monday…what do you think? Too many colors or a fun assortment of spring brights? Comments, please and thanks for visiting! It’s no secret that neon colors are in this summer. I personally cannot seem to get enough. I think the fashion gods were on to something when they decided to appeal to all of us who grew up in the 80s and still have a secret affinity for highlighter colors. I’ve always loved hot pink but neon yellow seems to be a close second this summer. I know this is one of those trends that will probably be in and out after a summer, but I’ll take my pop of bright colors when I can get them. 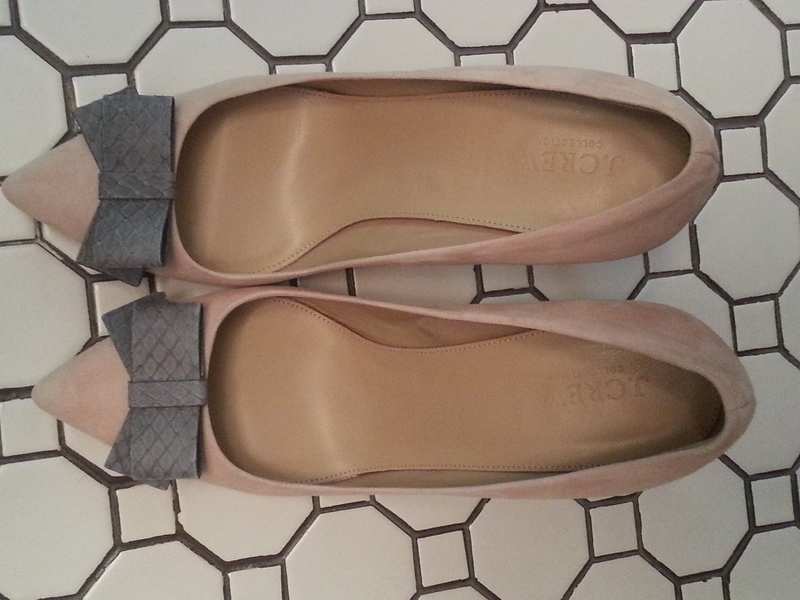 The J.Crew Mila Cap Toe Leather Ballet Flats have become a fast favorite of mine, and I find myself pairing them with basics to give that necessary pop of color. Today I decided to go all out and do the neon shoes and a my J.Crew Vintage cotton v-neck tee in neon yellow for my Saturday errands. I love J.Crew’s vintage cotton tees, but I do find the lighter colors to be somewhat sheer and the v-necks give me a little more cleavage than I want sometimes so I usually pair them with a Gap Favorite Cami. 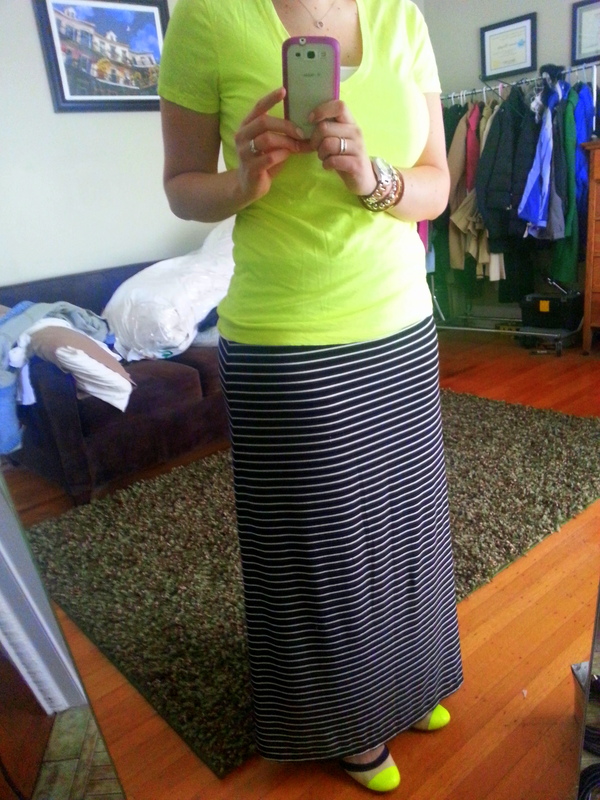 The maxi skirt is from last summer and is probably one of the most comfortable items of clothing I own. I’ve seen a similar one at the store this season but haven’t noticed anything online yet. The Mila flats are edged in navy and the skirt is black, but you really can’t tell with a long skirt and I would be impressed if anyone actually noticed. And because I can’t go anywhere without a light jacket or cardigan even in the dead heat of summer, I tossed my new Gap Destructed Denim Jacket on to complete the full on 80s inspired look. I wasn’t sure how much use I would get out of this jacket since I have my ten-year old basic blue J.Crew jacket that I still wear faithfully every year but it’s nice to have a different option. I didn’t end up actually wearing it as it was in the mid-70s and sunny today and there really was no need for a jacket. But I was prepared, just in case. I can’t stand being cold, so I must have a backup of some sort with me at all times. It’s a nice sunny casual look and I will keep the same outfit on to head out with DH in search of a casual spot with a patio for drinks and dinner this evening. I hope everyone else is enjoying their weekend! So, what do you think? Too bright or just right? Feel free to comment and thanks for visiting! So today I decided to delve back in to skirt-land after weeks of wearing primarily pants. I have a closet full of skirts, and I love wearing them, but in this awkward time of I can’t wear tights and my white bare legs might blind you, I’m somewhat hesitant to wear skirts. But after a few days of dismal weather and seeing a sunny day today I decided I could wait no longer to wear my J.Crew No. 2 Pencil skirt in navy-white stripe. I had originally planned on wearing my new Contessa snakeskin pumps to give my pale legs some help but as I was leaving for work, I grabbed my oasis green J.Crew Cece suede flats to wear to/from my car (no need to kill the blush suede shoes on the first wear) and the green Cece flats ended up being the shoes I wore all day. Excuse the slightly rumpled skirt since, as usual, I was trying to get ready and take pictures and look organized and be to work on time and I still haven’t figured out how to make all of that happen in a timely and organized fashion. I will say that after several runs with the iron, the skirt still looked a little rumpled but I didn’t have time to obsess over it. So then, I had a hair appointment after work tonight and I was so in love with my day combination that I decided to remix it for after work using the J.Crew lightweight boy shirt in stripe, J.Crew cashmere tee in neon azalea, Gap Destructed Real Straight Jeans,and J.Crew cece suede ballet flats. Necklace is a version of the J.Crew double crystal brulee necklace via eBay. What do you think? A successful remix or not creative enough? Comments please! What’s this…a self-photo?? Ok, so the mirror is more dusty than I realized since it’s in the spare room (getting right on that), but I think it isn’t too bad. I’m not sure why it’s so fuzzy either. Oh well, I’m still figuring all of this out! 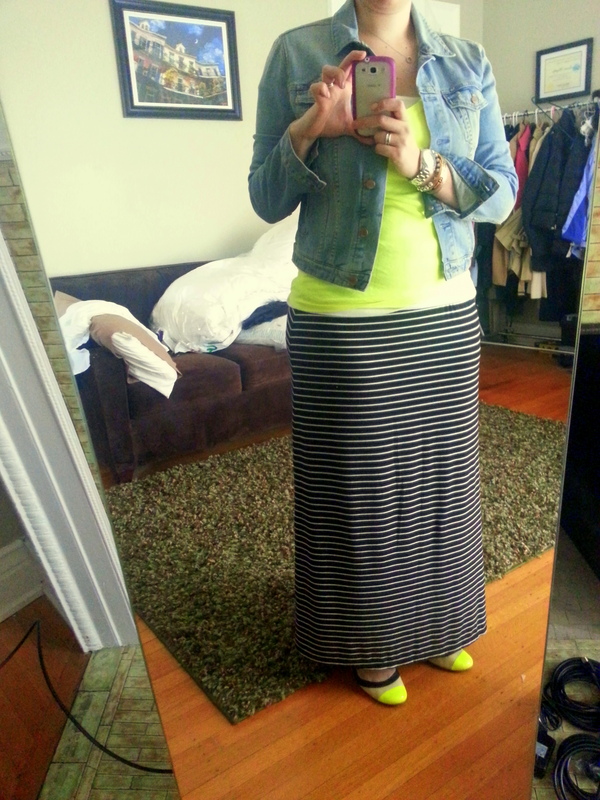 I think I’m naming this one of my favorite spring outfits of 2013. 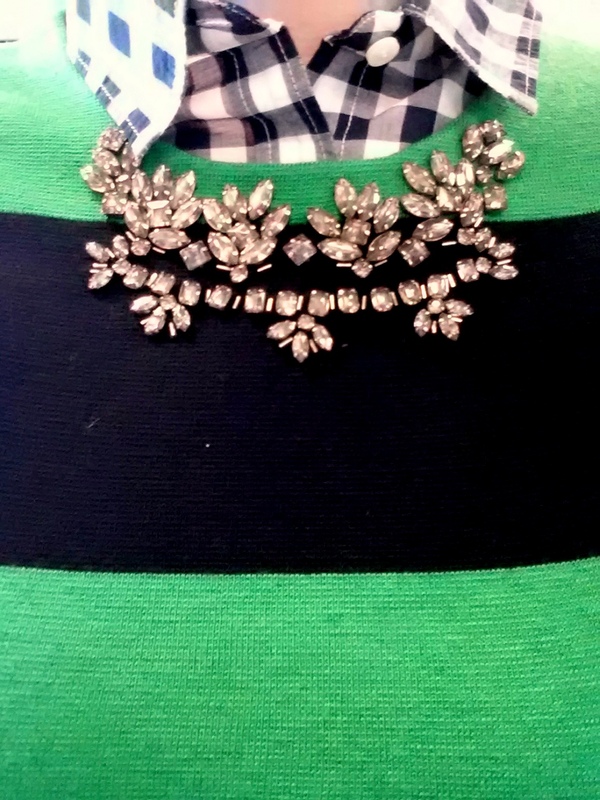 I originally tried the J.Crew Crystal necklace sweater on in the store sans button-up underneath and didn’t like it. Loved it on the rack, didn’t love the way my D-cup chest looked in it. But then I saw it on a friend of mine with a dotted shirt underneath and started to re-think it. And then it went on sale from $148 to $99 in the store with another 30% off and yeah, I was all over it. But I didn’t want to totally copy my friend (but I probably will when this Banana Republic shirt finally shows up from back order) so I decided to go the navy gingham route. 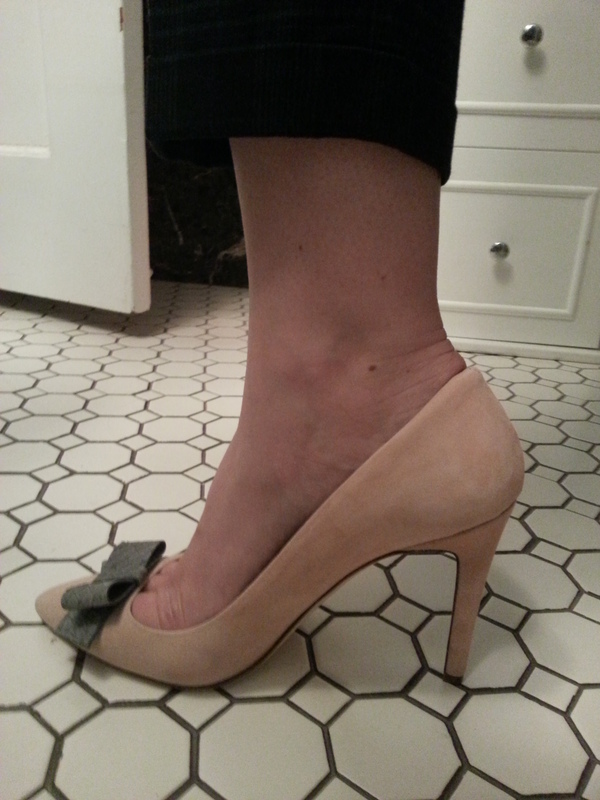 And well…some navy blue Banana Republic Sloan pants and my J.Crew factory Emery flats in bronzed clay and I was good to go. I will be repeating this outfit with jeans on the weekends…possibly white jeans as well. The Factory button-down is very lightweight, so it was not too bulky under the sweater. I didn’t need a blazer today but I probably would have grabbed my navy J.Crew schoolboy had I needed an extra layer. And here’s a close up of this beautiful sweater. No need to think about jewelry! So, what do you think about the outfit? The only thing I can think of to make it more perfect would be a bright pink purse 🙂 Thanks for visiting! Two weeks ago during one of my morning check-the-J.Crew website for popbacks routine, I spotted these pretties in my size and decided to try them out. Not being final sale, I figured I could take a bit more of a risk on them. I had honestly really admired them in the pink but not at their original price of $278. But with an extra 30% off the sale price and a quick perusal of sets on Polyvore (this is usually what drives me over the edge to purchase) I decided to give the blush stone colorway a try. They arrived, and they’re very beautiful shoes. But the color…oh, will I kill them after one wearing outdoors? I’d say that’s my primary concern at this point, and worrying about whether I have too much toe cleavage. Let’s take a look. I’d say the color is truly a blush stone. For me, they’re fairly close to my skin tone. 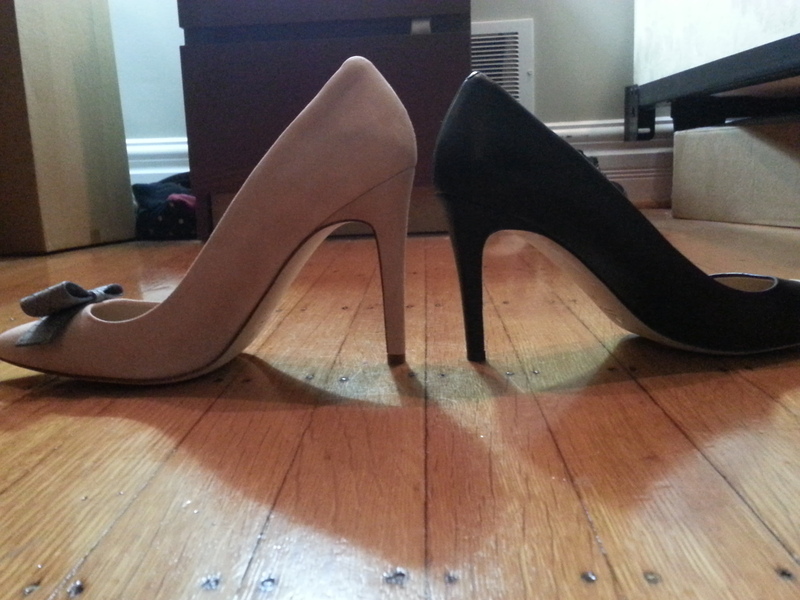 They advertise a 4″ heel which I believe. 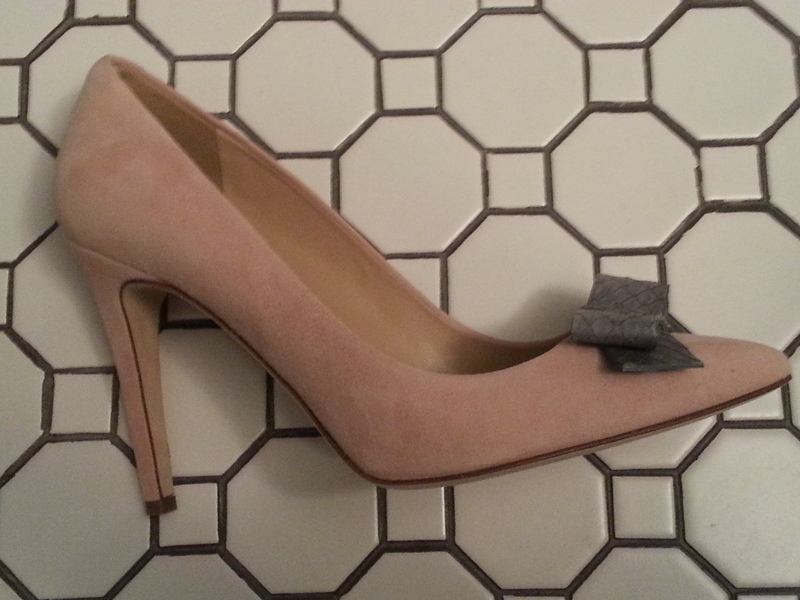 I took my usual size 9.5 that I take in J.Crew shoes (1/2 size up from my regular size). Not the most attractive shot of my feet. The toe cleavage looks pretty exaggerated here. And lastly, the pixelated houndstooth skirt which was a total disaster on me. But I do love the colors. And these shoes would be perfect with them. When am I going to learn that J.Crew’s kick-pleat skirts show me no love? 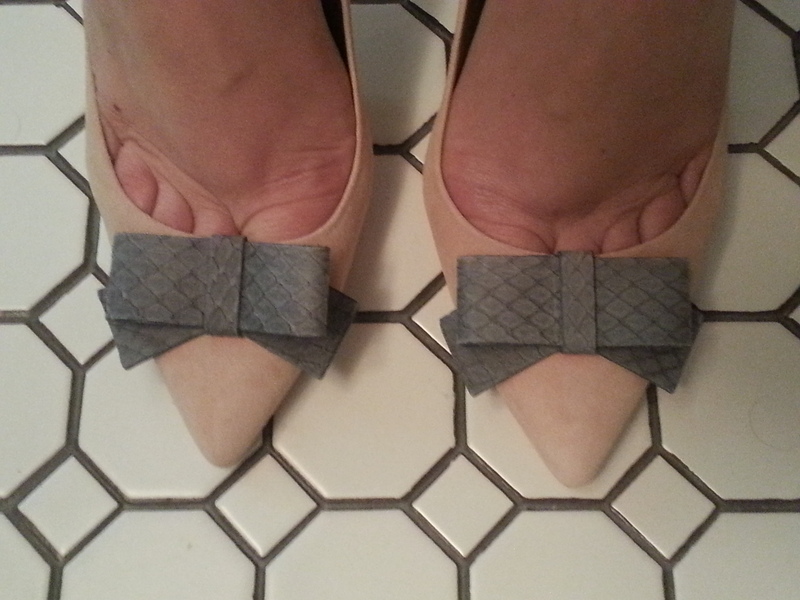 These shoes are still popping back in the mornings on the website in this color (no pink ones to be found). So…what do you think? Keep them or return them? My closet says yes, I’m still undetermined. As I said earlier, I’m worried about them getting destroyed immediately. And if I keep them, how do I keep them lasting longer and protect the suede? Comments please!